Translated from Irish, it means "The Courage of a Dancing Fox." MSD Irish Dance Academy trains competitive and non-competitive Irish Dance in Spokane, WA. We are committed to communicating and manifesting our vision. We partner with our community to nurture dancers, not simply offer dance classes. We enhance physical development, create emotional balance and stability, and inspire self-expression. Our attitude is serious in our play, which is embodied in the fox or in Irish the "sionnach." 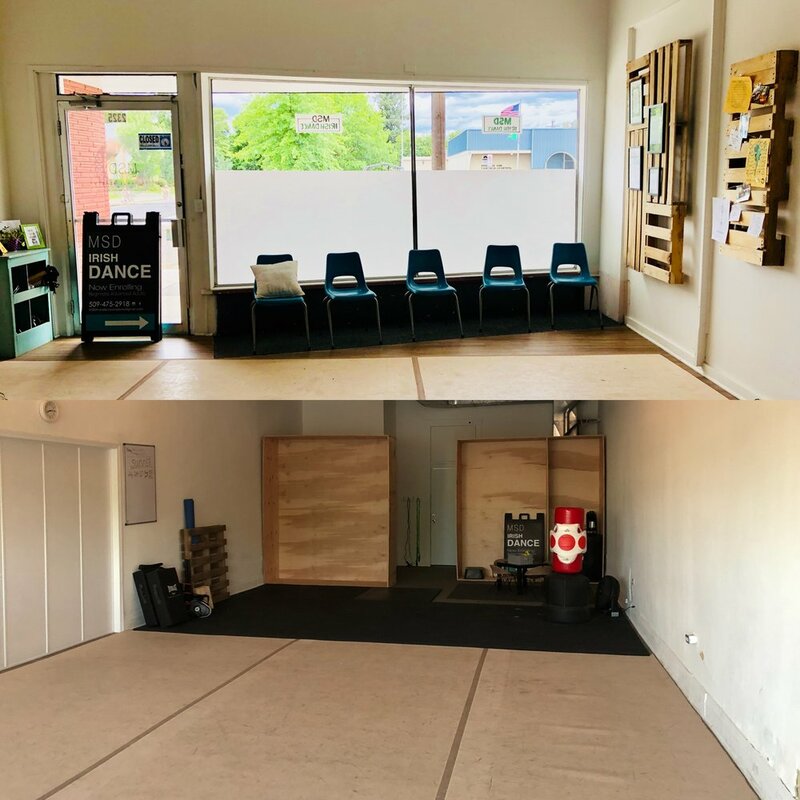 MSD Irish Dance academy would like to share space with you. We hold the lease for 2325 N. Monroe Ave. and currently have available hours for instruction while we are not teaching. We do not rent by the hour and would request a quarterly commitment. Schedules may change quarter to quarter. Advance notice will be given before the beginning of the next quarter’s changes. Before you are able to share space with us we must get approval from our land lord. Please be ready to provide your liability insurance and contact information. Mon. 6:00am – 1:30pm $100.00 per. mo. Tues. 6:00am – 1:30pm $100.00 per. mo. Wed. 6:00am – 1:30pm $100.00 per. mo. Wed. 2:00pm – 9:30pm $125.00 per. mo. Thur. 6:00am – 1:30pm $100.00 per. mo. Fri. 6:00am – 1:30pm $100.00 per. mo. Fri. 2:00pm – 9:30pm $125.00 per. mo. Sat. 6:00am – 1:30pm $100.00 per. mo. Sun. 6:00am – 1:30pm $100.00 per. mo. Sun. 2:00pm – 9:30pm $125.00 per. mo. 3.) wipe down restroom, equipment, and coffee bar before leaving with bleach wipes.